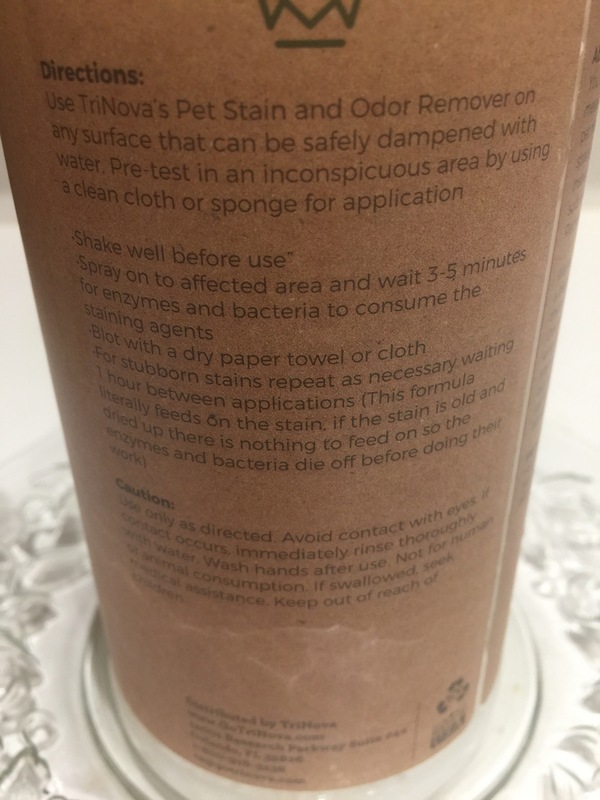 This was my first time using TriNova’s Pet Stain & Odor Remover. I had purchased one other product by the Trinova Company about three months ago and was very impressed with the product. So I was eager to find out if this would be another really good product. This is an environmentally friendly product that easily neutralizes odors with its advanced bio-enzymatic formula. This product is made with a safe, all natural formula. The product has a refreshing, pleasant scent and does not mask orders like other products. It contains natural enzymes that effectly destroy bad odors. I was watching a friends cat while she was out of town for a few days. While the cat was staying at my home he had a couple of accidents on my couch and floor. First, I blotted the cat urine with an old clean rag several times. Next I sprayed that area of my couch several times and waited a few seconds and the blotted the area with another clean old rag. I then let the area dry for about a half hour. I then rechecked the area to make sure it didn’t have anymore cat urine odor. It smelled clean and fresh, but I decided to clean it one more time just to be really sure. Then I let the area dry overnight and the rechecked it in the morning. The odor was gone. I rechecked the area several times over the next week and the odor did not return. Hapilly the new Pet Stain and Odor Spray Cleaner by TriNova had worked. I also used this product after the cat had a accident on my wood floor. I noticed the cat urine and quickly cleaned it up. I then sprayed the floor with this Pet Stain and Odor spray product and wiped the area clean and it was also odor free. 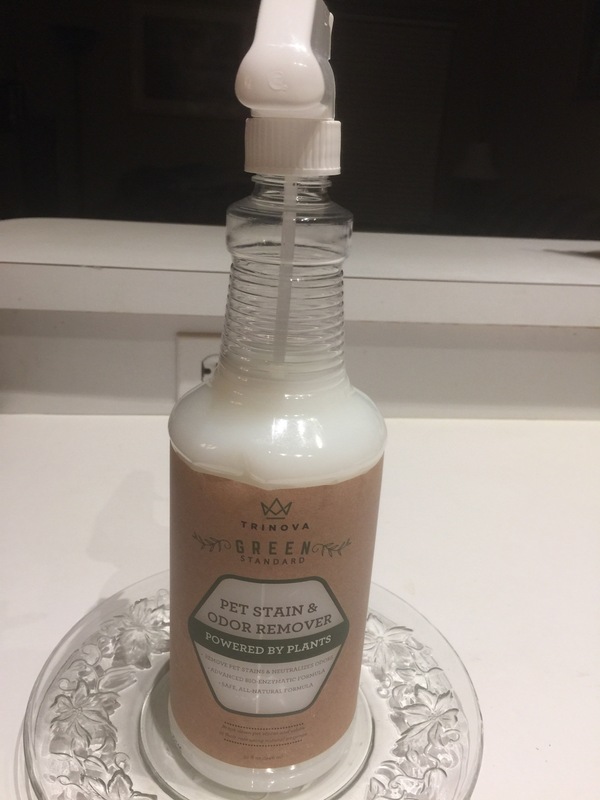 This Pet Stain and Odor remover is also great to spray in the bathroom to eliminate bathroom odors. I also used the spray in my utility room where I kept the cat litter box. I sprayed the product two or three times right above the litter box. I have also used this product after cooking fish and it worked great to quickly get rid of the fish odor. I find this to be another great new product by TriNova. It didn’t take much of the spray to clean and remove the pet stain and odors. This one 32 oz. bottle should last me a few months. This is a great product to keep on hand in my home. 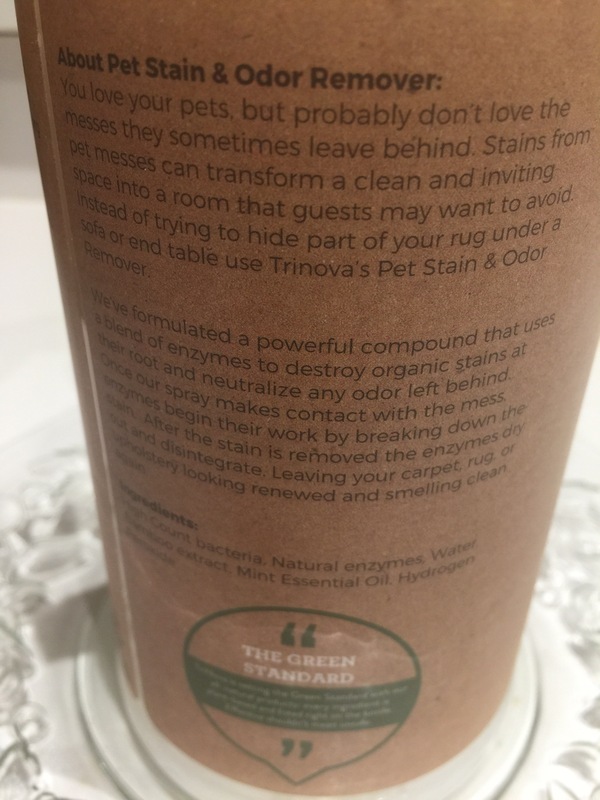 Love this Pet Stain and Odor Remover. This product is definitely well worth the cost.